Two popular SCAS publications “Children and Pets” and “Older People and Pets” are once again available for purchase through our website. Compiled by SCAS, this book provides an invaluable resource for anyone who is concerned about the well-being of older people, including health and social care professionals, veterinary staff and housing providers. 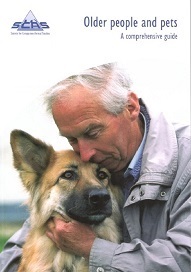 The reader is given insight into how companion animals improve health, provide social support and enhance the quality of life for older people in different settings – those living in the community as well as those in sheltered housing and residential care homes – and in different ways. The book addresses a wide range of key issues, from animal-assisted therapy programmes, to the challenges faced by older pet owners moving into sheltered housing, to the impact of pet loss for older people. The book contains some very useful guidelines on pet policy for housing providers and staff working in institutions. Parents have for many years recognised the benefits of pets for their children, but it is only in the last thirty years that the significant health and social benefits associated with animal companionship have been scientifically confirmed. We now have a greater understanding of the special bond that exists between children and companion animals and how this bond supports children in different ways throughout life. SCAS realised that much of the information and research on child-animal interactions would be of immense value to those responsible for children and who work with children. Members of SCAS, experts in their respective fields, have collaborated to produce this publication, which will provide an informative, accessible guide to developing positive interactions between pets and children. This booklet is helpful for anyone experiencing the loss of their pet. 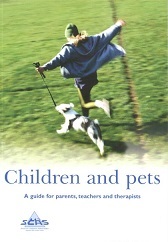 Written by a young child this book offers help for children coming to terms with the loss of their pet, including a guide for parents. This entry was posted in Human-Animal Bond, Pet Bereavement Support, SCAS and tagged aged, bond, book, children, education, guide, HCAB, literature, older people, pets, reading, SCAS, The Bond on July 29, 2013 by SCAS.